A radiated man-made hell hole known as Chernobyl has evolved from a tragic nuclear meltdown ‘incident’ into a darker, more subversive entity known as the Zone. An open-world of mutants, scavengers, cover-ups, factions, garbage, treasure, poverty and fortune is certainly an ambitious goal for a game. Mix that in with a FPS and some sprinklings of RPG and you’ll understand why not many have been made in the past. Developer Game World has gambled a lot to deliver such a feat, but has everything paid off for them? Stalker kicks off with your character being driven along in a ‘death truck’, lovely name; these trucks carry corpses from within the Zone to bordering towns. Well soon enough you’re found to be alive, which is supposedly a huge anomaly in itself as no one before has ever survived, they call them death trucks for a reason you know. So, we start not knowing anything about our past or with where we should have been going, the only clue is a PDA with instructions to kill someone. Visually Stalker is well too do, lets not forget this is an open-world environment we find ourselves in so I can forgive not having the most ground breaking graphics for efficiencies sake. Actually the weather is a fantastic touch, watching as the wind blows dust about is almost eerily real; fires raging at bonfires don’t look too superficial either. Details on character models are a little less impressive but they pass without drawing any sighs of disappointment. Sadly the interface is one giant hindrance to the whole game; its damn right terrible compared to many other games out there, FPS or RPG. The whole design and presentation looks off and feels clunky, using the PDA for most things is enough to make you recoil and think you’re back in the late 90’s. The mission objectives, which are based a long a RPG format, are squished up and can become uncomfortable to sift through. The map takes a little time to get used to so at first it will act more like a challenge than anything helpful. As I said missions are RPG-like, you aren’t given orders automatically and confined to closed spaces like most FPS games. 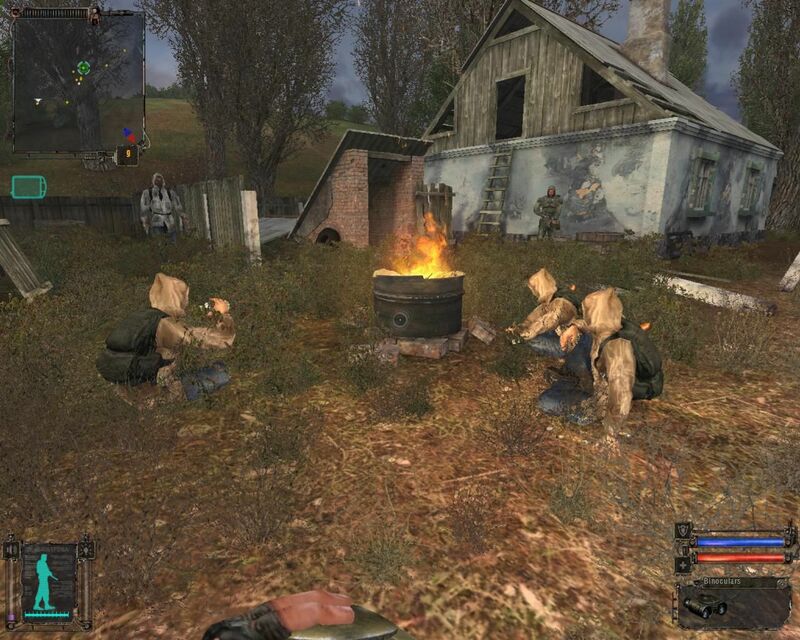 Instead you must hunt down NPCs with missions available for you to undertake, these can range from clearing out an area, picking up/stealing some supplies or offing some guy for various reasons. 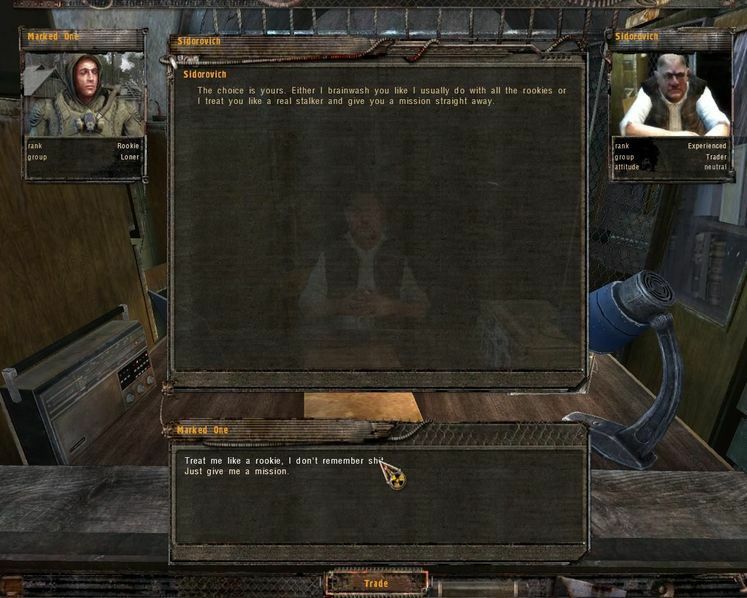 Dialogue in the game is at best moderate to poor with a great deal of inconsistency to whether you’ll be ‘treated’ with an audio accompaniment or not. Plot wise Stalker is quite bonkers but hey that’s what nuclear accidents will give you I guess. Going along I felt more off a completionists need to tackle missions more than actually caring really who or why I was doing what I was doing. 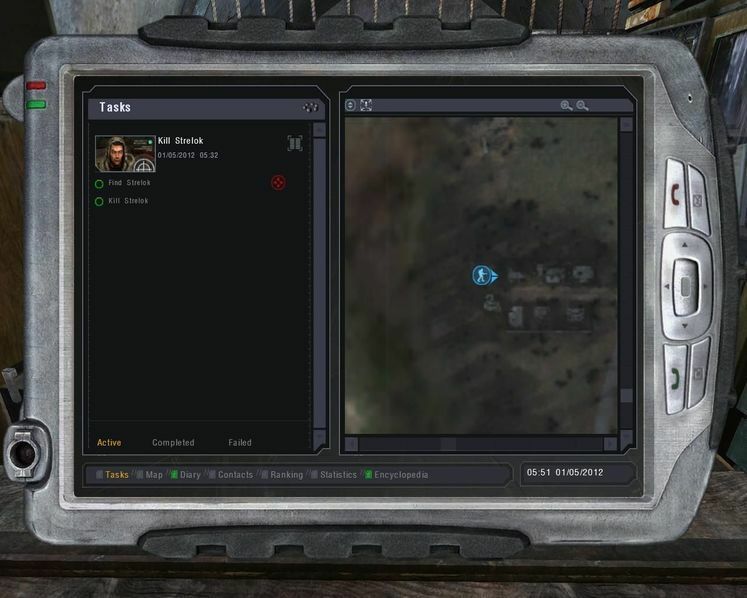 Should I care I’ve got this PDA with some guy I am supposedly meant to kill on it? Not really, because I was never presented with any tangible reason why I should care. Still it gets me out the bunker, and to meeting new mutant freaks. The array of foes or friendly guys you’ll come across will vary depending on your attitude to them. Sticking a gun in another’s face won’t earn much of their respect and they’ll refuse to speak with you, perform tasks for them and they’ll open up a little more. AI for foes is temperamental so at times they’ll be a real good challenge, then they can suddenly get hit with an IQ drain. Animals and other creatures take a little getting used to, they tend to run off if they lose enough of their pack. An important thing to remember is that when using the PDA or speaking with an NPC the game doesn’t pause. A few times I’ve been speaking with another then they suddenly run off to kill something, this hinders immersion and rips out chances for the player to care for what’s going on. Trading is simple and you’ll be doing plenty of this to keep your funds and the junk in your backpack down. The RPG element extends to your equipment, you can pick up lots of things when out and about but you’ll have to watch how much your carry. Also weapons have durability to them, something I despise myself but with the amount of guns that drop you needn’t worry. You don’t spend any sort of experience points in health, endurance or skills etc – instead you ‘level up’ by obtaining more powerful weapons and better armour for yourself. That is basically the extent of character customisation, a pity. 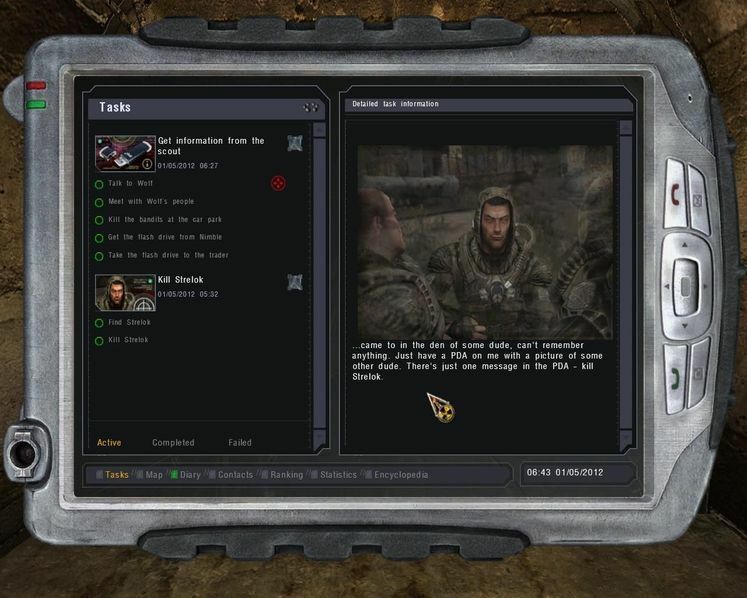 Throughout Stalker you’ll come across artefacts that gift you abilities or enhancements, some if not all also degrade you somehow so you have to be careful with combinations. You attach these artefacts to your belt and they become active, this is a rich incentive to explore the open-world but not for too long. Soon getting top-notch gear blunts enthusiasm to go walk-abouts in the woods. 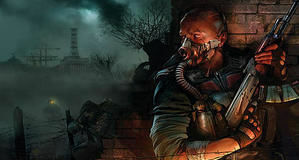 Stalker is also riddled with anomalies, weird scientific ‘glitches’ with reality that can prove fatal. These things are littered everywhere and make exploring, or fleeing from enemies a pain in the virtual rear. They’re a novelty and first but I soon hated every atom of their unnatural existence. 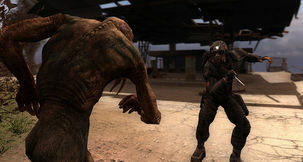 The sounds of Stalker are great and certainly have a spooky factor to them, howling winds and the grunts of mutants are enough to make you check that big shooter you’re holding is laden with ammo. Stop by a campfire or two and you’ll hear NPC’s nattering away, in Russian, and having a good laugh despite their dire surroundings. Guns have their nice boom effects and really draw a satisfaction as you blow down those unruly animals or bandit scum. A patch is now available for Stalker, which is near essential; bugs plague the game as much as anomalies plague the Zone (that’s a lot). 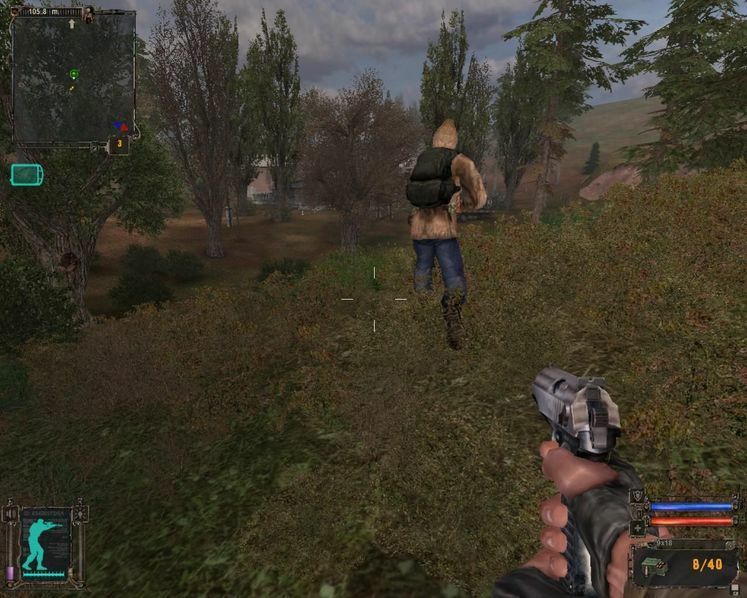 There are still a number of issues to be worked out, mainly things like the assassin level of accuracy from bandits, though of course it really does serve as the perfect incentive to practice your headshot technique. Save! For the sake of your own sanity remember to quicksave often or your resultant frustration will likely turn your room into a mini-Chernobyl. Death can come from animals, bandits, radiation or those accursed anomalies. 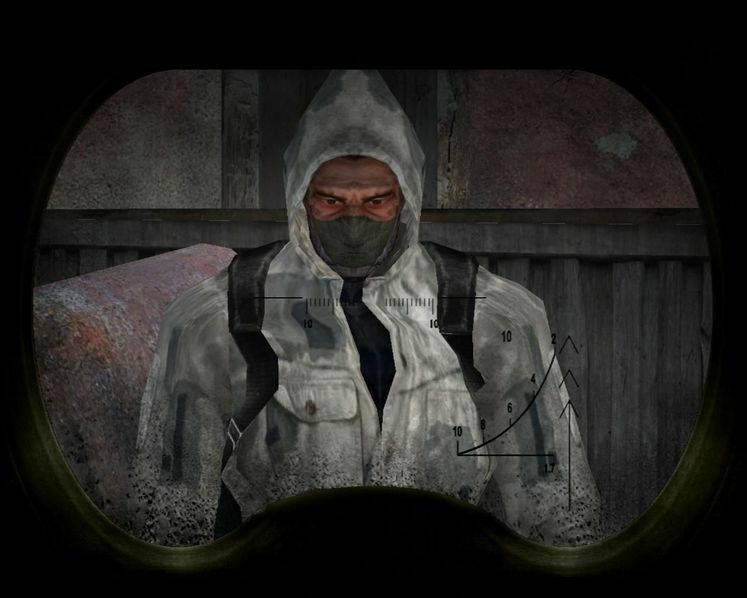 Bleeding is a factor in Stalker; if you take too many hits then you’ll need the help of bandages quick. Vodka helps ease the radiation sickness; fortunately these will come in their abundance if you go hunting for bandits and the like, as will ammo. 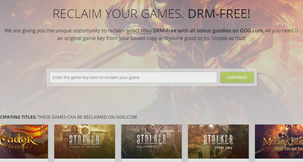 Multiplayer components of Stalker come in the expected FPS flavours with the added ability to buy better equipment and armour through matches with money. You earn more cash by killing more opponents and claw your way up the rankings, for the most part you’ll probably be sticking with the single player portion. Weapons and combat in general have a more authentic and realistic twang to them than most other FPS titles would care to go. Early weapons are pathetic at best and have questionable accuracy and reliability, finding better weapons later really make you appreciate good craftsmanship that’s for sure. You can wipe the floor with enemies from the beginning zones with your upgrade arsenal of death later on, showing how powerful you can become. The general environments of Stalker are apocalyptic, GSC have done their homework for the ‘screwed future’ setting. It’s tragic that most of that brilliance and creativity is marred by a lack of interesting or engaging NPC characters, oh and the interface too lets not forget. It has so much to offer gamers but with its current level of bugs I fear many won’t give it much chance to prove itself past initial hours, hopefully they’ll address them soon enough. My kingdom for a decent PDA! Stalker Shadow of Chernobyl is an ambitious title from GSC, one that succeeds and amazes in some areas but almost horridly trips and stumbles along in others. Still I find myself liking the game and am willing to overlook its potholes. Stalker is a game, that for the moment at least, you’ll either find you can forgive and move on with it (patches applied), or condemn its flaws and never grant it the light of your day. Remembering after having died that the game auto saves entering new zones. Save people, and save often!